The Written Image exhibition opened yesterday at the Edinburgh Printmakers gallery and is on until 21st December. There are 54 beautiful exhibits showing a wide variety of prints, books, posters, sculptures, prayer flags and more; all the result of collaborations between 38 pairs of artists and poets. I really enjoyed collaborating with artist Kittie Jones. We used our mutual interest in wildlife as a starting point and went on two trips to Inchcolm island, in the Firth of Forth, in the summer. 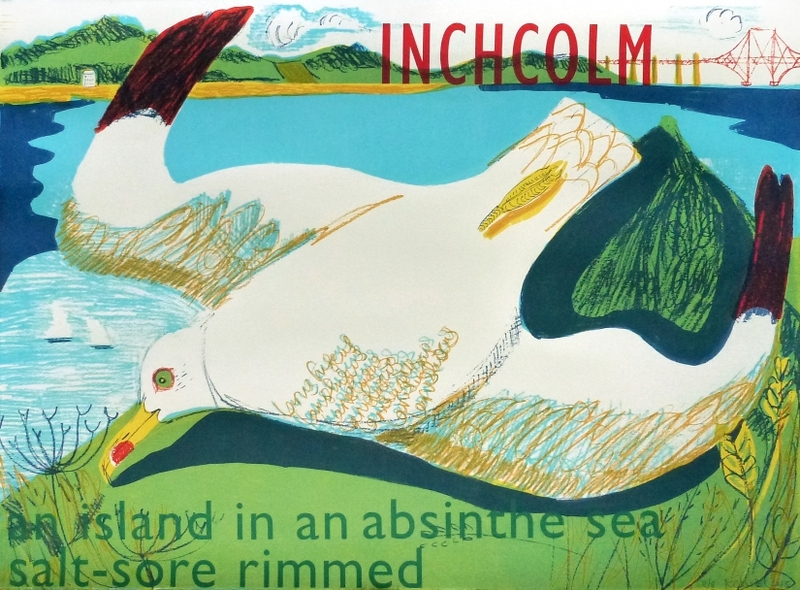 On our first trip, during seabird breeding season, we had a Hitchcockian day amongst the birds which formed the basis of my poem and Kittie’s print: Larus Fuscus (lesser black-backed gull), shown above. The print is big, bold and beautiful and looks even better in the flesh. The poets will be reading their poems, accompanied by projected images, at Inspace, Edinburgh on 4th December at 7pm – book a free ticket here.